I have seen a great many lost/stolen pet fliers during my peregrinations in our fair city. This undoubtedly due in some part to the fact some have taken to making a cottage industry of stealing dogs for resale, the collection of reward money or worse. Each and every one of these fliers is heart-wrenching in its own way. This one (spied today on Thames Street) is no exception. However, it sports a significant difference from its peers. Specifically: what it offers in the way of an incentive for Rocky’s safe return. 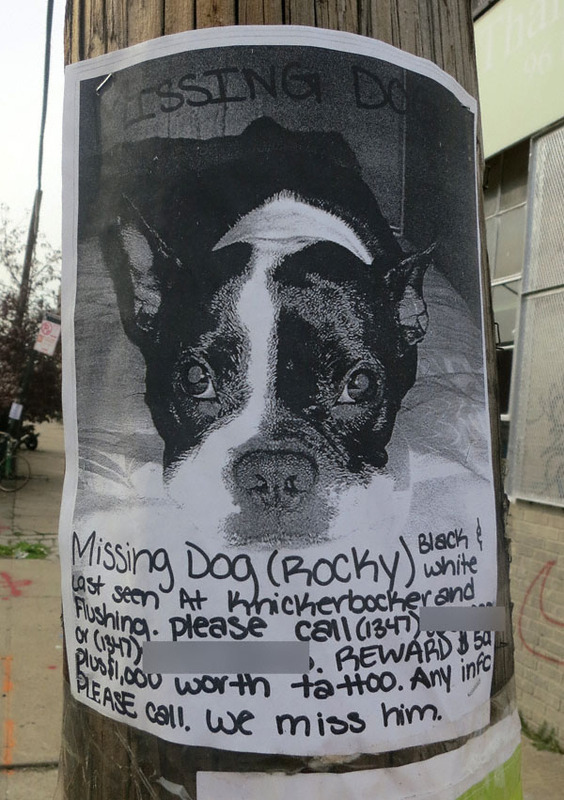 Although I have taken the liberty of blurring out the phone numbers of this “people” (for fear posting them would subject them to further heartbreak via telephonic ridicule) those of you who live on or near Kickerbocker Avenue and Flushing Avenue please keep an eye out for this little guy. His family clearly misses him.